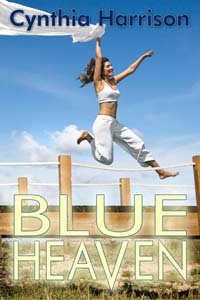 I’ve already announced that from October 1-5 Blue Heaven will be free for everyone on Kindle. You don’t need a Kindle to buy it, you just need the app, which is free on iTunes. As is my tradition, in my blog birthday month, I like to give presents to my readers. I finally figured out what I want to send to the first four of you who comment on this post with a specific suggestion about what I should post next. I need four different ideas, folks. What would you like to read about here going forward? As I transitioned from writer-seeking-publication into published author, I knew the blog would have to change from what it had been. I’d reached the goal I’d been pursuing for so long. I have a great publisher who has put out two of my three novels; they are willing to grow with me beyond romance into women’s fiction. Blue Heaven is the first in the “Blue Lake” series about a small tourist town on a big lake. And don’t worry, for me women’s fiction just means I get to tell two (or more!) love stories instead of one. I’m a die-hard romantic and am having so much fun creating stories about the people in Blue Lake, both newcomers and those with deep roots. It took me a while to figure out that now I need to write for readers and maybe not so much for writers anymore. After eleven years, there isn’t much left to say about the writing process except if you want something NEVER give up. That’s how I snagged my dream. Onto the prize. I now have three books in print: Your Words, Your Story, The Paris Notebook, and Blue Heaven. Well, Blue Heaven is set for world-wide release and print sometime in November. What I will do is send out all three print editions to the first four people (Sorry, USA only. Foreign postage is really expensive.) who present me with a great topic for a post in the comments. You will get the prizes when I get the Blue Heaven print editions, but the little contest starts now. The inspiration and reasoning behind the books you have written. OK Jenny:) I love talking about that, so thanks! And send your address to cindy@cynthiaharrison.com so I can send books to you. Hi Cindy. First…I love all your book covers. They are FUN. Second, I can’t wait to read Blue Heaven. It’s locked an loaded on my kindle. For your description and reading your blogs, I can already tell I’m going to love it. Congratulations Cindy on all your success. This is exciting! My suggestion for a topic is one that I wonder about when I read a novel: How does a writer know where to start a character’s story? As an adult I read novels about adults, people who have lived for many years. How do you know when to pick up the thread of your characters’ lives? Great meaty topic Sharon. Will post my thoughts for you soon:) and don’t forget to send me your address at cindy@cynthiaharrison.com!